Every time Tracy and I hang out, the conversation inevitably turns towards music. This is hardly surprising I guess, as this is the context in which we met and have become friends: dance events, volunteering or organising dance events, DJing at dance events, you get the idea. She has also become one of my most regular and loved gig-buddies: Lake Street Dive, Trombone Shorty, Macklemore, you name it, she’s up for it! So, as mentioned, we often talk about music: the things we’ve heard, saw live or on TV, read, and experienced whilst travelling. Consequently, Tracy has asked me a few times to write a guest post on her blog and finally, this time around, I have managed to get it together in time for 12 days of Bluesmas. So. This is me gushing about my favourite city and its music, New Orleans, through the medium of a documentary series created by the Foo Fighters. I know, a bit random, but bear with me here. This short write-up is intended more as a taster and a nudge to go out and explore for yourselves, listen to the musicians I list, and find others you love, because most of the music you love as dancers was influenced in a tiny, or more likely a very large part, by this city. Dave Grohl of the Foo Fighters had a vision for the band’s 20th anniversary album. He decided to explore US cities and the ways in which the music that was created in them was influenced by the city itself. Grohl, the Foo Fighters (and the production crew) thus embarked on a truly epic American road trip, spending time in eight (!) musically influential cities to learn about their (not just musical) history and to write and record in each of them. Perhaps Chicago would be the more obvious choice to talk about, as it features greats like Buddy Guy and is focussed heavily on blues, but I found the New Orleans episode the most gripping and informative. The whole series can be purchased per episode on iTunes. My recommendation would be to start with NOLA and Chicago, then – depending on your interest in grunge or country music or your nerdy-ness level when it comes to music history – to watch the rest of the series. 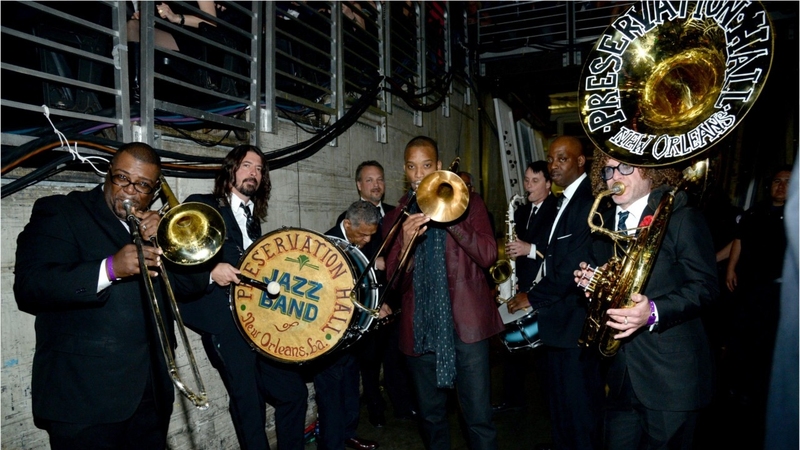 The episode centres around Preservation Hall, as the venue at which the Foo’s record their song ‘In the Clear’, AND as the beating heart of New Orleans’ musical tradition they explore during the 60’ running time. The current owner, Ben Jaffe, who is the son of the original founder of Pres Hall Allan Jaffe, as well as a member of the Pres Hall Jazz band – he plays the sousaphone – relates the early history of the building and talks about how it came to play such a vital part in preserving and celebrating the city’s musical tradition. One of the many highlights of the episode is the glimpse we get into the inner workings of the hall, both at its inception and in the present day. Indeed, the Hall is a great way to anchor the exploration of the city’s history, as most of the Crescent city’s musicians, old and young have played or aspired to play a show in the hallowed hall – another highlight in the show involves a recording of Louis Armstrong as he talks about the revered place of Preservation Hall in the city’s musical life. Once the foundations have been laid, Grohl takes on the role of interviewer, delving into the lives of the greats that have made music in the city (in the beginning often against the word of the law). We get to hear stories about the Neville Brothers, Dr John, Alain Toussaint, The Meters and Trombone Shorty with many more musical heroes referenced along the way. In fact, one of the greatest strengths of the show is that it makes a considerable effort to dive deep into the city’s musical story, and emerge with some rather wonderful nuggets of information. Having watched the episode 6-7 times, I still stumble upon new bits of information with every new viewing. Dave Grohl clearly attacked this project with the same dedication bordering on obsession he does everything else with – this is after all the man who laid the entirety of the Foo Fighters’ first album down by himself in a studio with a dozen instruments in the span of about 2 weeks before the band even existed! The madcap energy and enthusiasm that is so characteristic of Grohl shines through the whole series. There are millions of stones to turn over when it comes to exploring the birthplace of jazz, and he takes a pretty good stab at turning as many as he can in a short span of time and time flies by surprisingly fast. New Orleans Jazz Fest and its beginnings get mention (fun fact: the Foo’s headlined the festival in the year the show was recorded), and this is where we segue more into present-day NOLA music with Trombone Shorty, as well as the devastation and still ongoing (musical) ‘revival’ of New Orleans after Katrina more than a decade ago. Lastly, another great source, everynoise.com will most likely have all of the musicians name-checked by the show and millions more (sorted into musical genre clouds!) with links leading all the way to Spotify, just in case you have a free week to jump down a musical rabbit hole. Many thanks to the author Reka Sardy. Reka is a dancer, DJ and all-round music geek currently living in London.